Kiseeva, E.S., Wood, B.J., Ghosh, S., Stachel, T. (2016) The pyroxenite-diamond connection. Geochem. Persp. Let. 2, 1-9. Kiseeva, E.S., Yaxley, G.M., Stepanov, A.S., Tkalcic, H., Litasov, K.D., Kamenetsky, V.S. (2013a) Metapyroxenite in the mantle transition zone revealed from majorite inclusions in diamonds. Geology 41, 883-886. ). In this study we show that the pyroxenite-diamond association is a consequence of the interaction between basaltic and peridotitic compositions in the presence of carbonate melt and that layering of the pyroxenites is a natural consequence of this interaction. Reduction of carbonate to carbon at high pressures is responsible for the genetic connection between pyroxenite and diamond and the abundance of pyroxenitic inclusions reflects this connection rather than a high abundance of this rock type in the mantle. Figure 1 Compositions of 16 eclogitic, 75 pyroxenitic and 32 peridotitic majorite inclusions in natural diamonds as functions of (Si + Ti) pfu (per formula unit), showing (dashed lines) the theoretical “peridotitic” and “eclogitic” substitutions discussed in the text (after Kiseeva et al., 2013a). 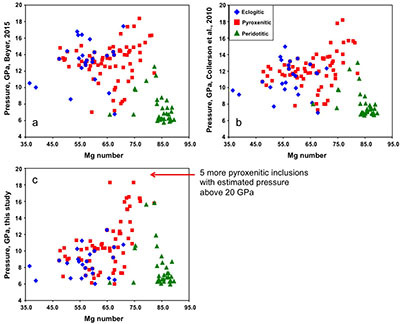 Figure 2 Bulk compositions of natural pyroxenites (grey circles) plotted in MgO-Al2O3 compositional space. 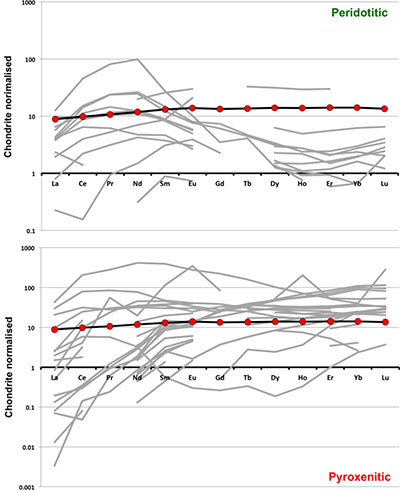 Dashed red line shows the regression line for all the pyroxenites. (a) Compositions of majoritic inclusions in diamonds of eclogitic (red), pyroxenitic (blue) and peridotitic (light green) affinities. Fields of bulk rock peridotite and MORB are shown as blue ovals. (b) Tie line between a majoritic garnet and calculated coexisting clinopyroxene (Cpx; see text for details). A possible bulk rock composition for this pair was placed on the red regression line. (c) Population of natural majoritic garnets and reconstructed clinopyroxene compositions. Field of Cpx compositions is shown with the yellow oval. Note wide range of potential bulk (pyroxenitic) source rock compositions. Placement of the latter around the regression line is meant only to be indicative. (d) Majoritic inclusions in diamonds (green circles) which coexist with clinopyroxene(s) (green triangles) within the same diamond. The range of observed natural clinopyroxene compositions occupy the area predicted by our modelling. Orange circles show the bulk composition and the majorite-clinopyroxene pair which crystallised in an experimental run at 15 GPa and 2150 °C. Figure 3 Chemical potential diagram (at fixed pressure and temperature) showing stabilities of phases coexisting with clinopyroxene. Curvature of garnet field boundaries is due to changing composition on passing from eclogite to peridotite (see text). Interaction between eclogite and peridotite will lead to gradients in chemical potentials of MgO and CaO (red dashed line) and layers of orthopyroxene next to peridotite and garnet next to eclogite. Fo-forsterite, En-orthopyroxene, Q/Co – quartz/coesite, Grt – garnet, An – anorthite, Cpx – clinopyroxene. Figure 4 Back-scattered electron images of SA2-1 run products. The experimental conditions are 3 GPa and 1350 °C. Panel (b) shows an enlarged area from panel (a). Orthopyroxene (on the peridotite side) and garnet (on the eclogite-side) are formed within the reaction zone between carbonated eclogite and peridotite. Figure S-1 Bulk rock compositions of natural pyroxenites (grey circles), majoritic inclusions in diamonds of eclogitic (orange triangles), pyroxenitic (purple triangles) and peridotitic (green triangles) affinities and reconstructed clinopyroxene compositions of eclogitic (orange diamonds) and pyroxenitic (purple diamonds) affinities. Blue lines represent selected tie lines between natural majoritic garnets and reconstructed clinopyroxenes. Figure S-2 Majoritic garnet LILE and HFSE abundances normalised to CI-chondrite. (McDonough and Sun, 1995). Majorites of peridotitic affinity are significantly more depleted in Nb, Ti, Zr, Hf and Y than pyroxenitic majorites. Low Ba and Sr abundances in pyroxenitic majorite is possibly due to coexisting clinopyroxene. Red circles show abundances for primitive (>8.7 wt. 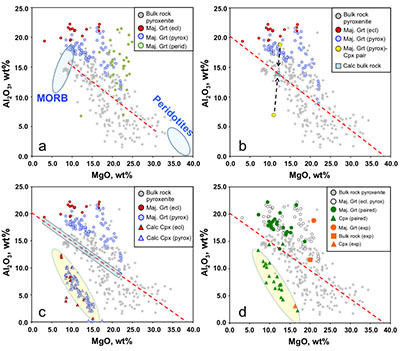 % MgO) MORB glasses (Jenner and O'Neill, 2012). Figure S-3 Majoritic garnet REE abundances normalised to CI-chondrite (McDonough and Sun, 1995). Majorites of peridotitic affinity are significantly more depleted in Heavy REE. Red circles show abundances for primitive (>8.7 wt. % MgO) MORB glasses (Jenner and O'Neill, 2012). 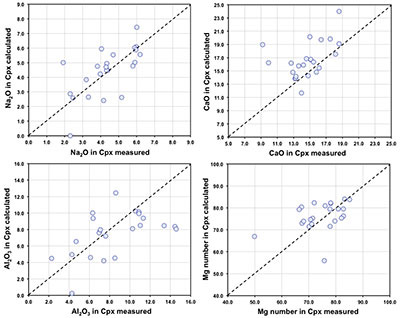 Figure S-4 Comparison of Mg#, CaO, Al2O3 and Na2O contents of natural clinopyroxene inclusions with those calculated to be in equilibrium with pyroxenitic and eclogitic majorite. Clinopyroxene compositions are taken from the following studies: Moore and Gurney, 1989; Wilding, 1990; Hutchinson, 1997; Stachel et al., 2000; Davies et al., 2004; Pokhilenko et al., 2004; Bulanova et al., 2010. Figure S-5 Estimated pressure of majoritic inclusions based on three different geobarometers. Table S-1 Experimental run products. Table S-2 Compositions of run products. Between 8-15 GPa, with increasing pressure the orthopyroxene and clinopyroxene of peridotite dissolve into garnet through the peridotitic “majorite” substitution: 2Al3+ = Si4+ + M2+, where M2+ represents divalent Mg, Fe, Ca and Mn (Fig. 1). In the transition zone (410-660 km depth) “peridotite” thus becomes a bimineralic rock composed of majorite plus a high pressure polymorph of (Mg,Fe)2SiO4 (wadsleyite or ringwoodite). Under the same conditions basalt initially transforms to eclogite (garnet plus clinopyroxene) and then with increasing pressure the clinopyroxene dissolves into the garnet through a combination of the peridotitic substitution and a second eclogitic substitution: M2+ + Al3+ = Na+ +Si4+. In this case, the garnets become richer in Si and Na and poorer in Al and, in the deepest parts of the transition zone (pressure >18 GPa), eclogite becomes monomineralic garnetite. Hirschmann, M.M., Stolper, E.M. (1996) A possible role for garnet pyroxenite in the origin of the ''garnet signature'' in MORB. Contributions to Mineralogy and Petrology 124, 185-208. Anderson, D.L., Bass, J.D. (1986) Transition region of the Earths upper mantle. Nature 320, 321-328. ). An alternative possibility is that inclusions in diamond are biased toward the pyroxenite lithology, which requires an intimate connection between the source of diamond carbon and pyroxenite generation. This connection is investigated here. Collerson, K.D., Williams, Q., Kamber, B.S., Omori, S., Arai, H., Ohtani, E. (2010) Majoritic garnet: a new approach to pressure estimation of shock events in meteorites and the encapsulation of sub-lithospheric inclusions in diamond. Geochimica et Cosmochimica Acta 74, 5939-5957. Beyer, C. (2015) Geobarometry, phase relations and elasticity of eclogite under conditions of Earth’s upper mantle. PhD thesis, University of Bayreuth, Interdisciplinary Institutions, 217pp. 143, 56-70. In this study we use a database of 16 eclogitic, 75 pyroxenitic and 32 peridotitic majorites reported in the literature (Fig. 2a) and calculate a clinopyroxene composition for each one, shown in Figure 2b.
. Note that the recalculated clinopyroxenes occupy a fairly narrow field highlighted in Figure 2c by a yellow oval. As mentioned above, inclusions of majoritic garnet and clinopyroxene in the same diamond are extremely rare, but nevertheless the few occurrences available enable us to test our calculation method (Fig. 2d). In Figure 2d we compare our field of calculated clinopyroxene compositions with the observed compositions of clinopyroxenes coexisting with garnet in the same diamond. As can be seen, the agreement is excellent. Similarly, in Figure 2d we show the results of an experiment in which a pyroxenitic bulk composition was reacted at 15 GPa and 2150 °C. Despite the extreme temperature, used to enhance reaction rates, the composition of clinopyroxene coexisting with garnet can also be seen to be in excellent agreement with our calculation approach. Downes, H. (2007) Origin and significance of spinel and garnet pyroxenites in the shallow lithospheric mantle: Ultramafic massifs in orogenic belts in Western Europe and NW Africa. Lithos 99, 1-24.
) 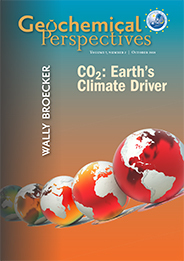 strongly suggests that one important and widespread mechanism involves carbon. Since diamond is inert, the most plausible origin of the association is through interaction between eclogite and peridotite in the presence of carbonated melt or fluid. In order to investigate the possible formation of pyroxenite through the interaction of carbonated eclogite with peridotite we performed high-pressure sandwich experiments in a piston-cylinder apparatus. Model quartz-eclogite and peridotite compositions in the system CaO-MgO-Al2O3-SiO2 (reduced in CaO content to take account of added carbonate) were mixed with ~5 % of CaCO3 and loaded on top of one another in a 3 mm Pt capsule. The capsule was welded shut and the experiments performed at 3 GPa and 1350 °C for between 1.5 and 8 hours (Supplementary Information). Under these conditions a SiO2-poor carbonate melt develops from the CaCO3 introduced in the starting materials and enhances the rates of reaction between the two principal lithologies. Allegre, C.J., Turcotte, D.L. (1986) Implications of a 2-component marble-cake mantle. Nature 323, 123-127. Korzhinskii, D.S. (1959) Physicochemical basis of the analysis of the paragenesis of minerals. Translated from Russian. Consultants Bureau, New York. 142pp. , we would expect development of high variance assemblages, typically monomineralic zones, controlled by diffusion of major elements between the two components. 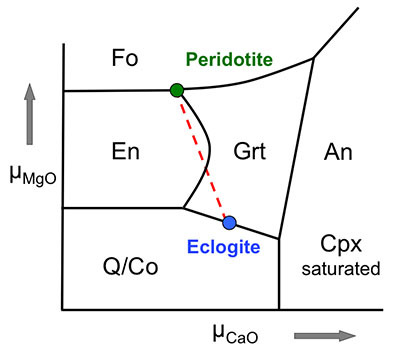 Figure 3 shows a schematic (simplified) chemical potential diagram in µCaO-µMgO space which exhibits how mineralogical banding should develop between coesite-eclogite and peridotite. Both rocks contain clinopyroxene and garnet, but the excess SiO2 in the eclogite should react with the peridotite to form a layer of orthopyroxene (± clinopyroxene) next to the peridotite and a layer enriched in garnet and without coesite next to the eclogite. The garnet should become more Mg-rich as we pass from eclogite to peridotite and we have represented this predicted change with curved boundaries to the garnet field. Figure 4 shows back-scattered electron images of the products of experiment Sa2-1 which generated the predicted monomineralic layers between eclogite and peridotite. As predicted, after 8 hours of reaction at 1350 °C, garnet composition changes progressively from 22.9 wt. % MgO, 8.8 wt. % CaO in the eclogite layer to 25.1 wt. % MgO, 7.0 wt. % CaO in the garnet layer to 27.0 wt. % MgO, 6.1 wt. % CaO in the peridotite. These phase compositions, in an idealised Fe-free system are consistent with those found in lherzolites and eclogites. The model sandwich experiments demonstrate, therefore, that zoned garnet pyroxenites may be formed as a result of a wall-rock reaction between silica-saturated, carbonated eclogite and silica-undersaturated peridotite. Pearson, D.G., Davies, G.R., Nixon, P.H. (1993) Geochemical constraints on the petrogenesis of diamond facies pyroxenites from the Beni Bousera peridotite massif, North Morocco. Journal of Petrology 34, 125-172. Aulbach, S., Stachel, T., Viljoen, K.S., Brey, G.P., Harris, J.W. (2002) Eclogitic and websteritic diamond sources beneath the Limpopo Belt - is slab-melting the link? Contributions to Mineralogy and Petrology 143, 56-70. Dasgupta, R., Hirschmann, M.M. (2010) The deep carbon cycle and melting in Earth's interior. Earth and Planetary Science Letters 298, 1-13. Kerrick, D.M., Connolly, J.A.D. (2001) Metamorphic devolatilization of subducted oceanic metabasalts: implications for seismicity, arc magmatism and volatile recycling. Earth and Planetary Science Letters 189, 19-29. Yaxley, G.M., Brey, G.P. (2004) Phase relations of carbonate-bearing eclogite assemblages from 2.5 to 5.5 GPa: implications for petrogenesis of carbonatites. Contributions to Mineralogy and Petrology 146, 606-619. Wood, B.J., Bryndzia, L.T., Johnson, K.E. (1990) Mantle oxidation state and its relationship to tectonic environment and fluid speciation. Science 248, 337-345. Wood, B.J., Pawley, A., Frost, D.R. (1996) Water and carbon in the Earth's mantle. Philosophical Transactions of the Royal Society of London Series A-Mathematical Physical and Engineering Sciences 354, 1495-1511. Woodland, A.B., Koch, M. (2003) Variation in oxygen fugacity with depth in the upper mantle beneath the Kaapvaal craton, Southern Africa. Earth and Planetary Science Letters 214, 295-310. Kiseeva, E.S., Litasov, K.D., Yaxley, G.M., Ohtani, E., Kamenetsky, V.S. (2013b) Melting and phase relations of carbonated eclogite at 9–21 GPa and the petrogenesis of alkali-rich melts in the deep mantle. Journal of Petrology 54, 1555-1583. Stagno, V., Ojwang, D.O., McCammon, C.A., Frost, D.J. (2013) The oxidation state of the mantle and the extraction of carbon from Earth's interior. Nature 493, 84-90.
have shown experimentally that, in normal mantle, carbonate is replaced by diamond and Fe3+-bearing garnet at depths below ~160 km further confirming the validity of our model. Tappert, R., Stachel, T., Harris, J.W., Muehlenbachs, K., Ludwig, T., Brey, G.P. (2005) Subducting oceanic crust: the source of deep diamonds. Geology 33, 565-568. Ickert, R.B., Stachel, T., Stern, R.A., Harris, J.W. (2015) Extreme 18O-enrichment in majorite constrains a crustal origin of transition zone diamonds. Geochemical Perspectives Letters 1, 65-74.
) are predictable outcomes of our model. We conclude that the high relative abundance of “pyroxenitic” garnets as inclusions in diamonds is a consequence of the genetic relationship between carbon and pyroxenite-formation rather than an indication of the high abundance of pyroxenite in the transition zone. We thank Marc Hirschmann and Dante Canil for thorough and constructive reviews. We acknowledge support from European Research Council grant 267764 to BJW and the NERC grant NE/L010828/1 to ESK. Allègre, C.J., Turcotte, D.L. (1986) Implications of a 2-component marble-cake mantle. Nature 323, 123-127. The experiments simulate a sharp compositional boundary between peridotite and basalt (coesite-eclogite at 3 GPa), analogous to the situation in subducted lithosphere having veins and lenses of basaltic composition dispersed in peridotite (Allègre and Turcotte, 1986). The potential implication is that pyroxenite could be a major rock type in the mantle transition zone, a hypothesis explored extensively 30 years ago (Anderson and Bass, 1986). Trace element patterns of websteritic garnet inclusions in diamonds also suggest a mafic precursor source, most likely subducted heterogeneous oceanic crust (Aulbach et al., 2002). 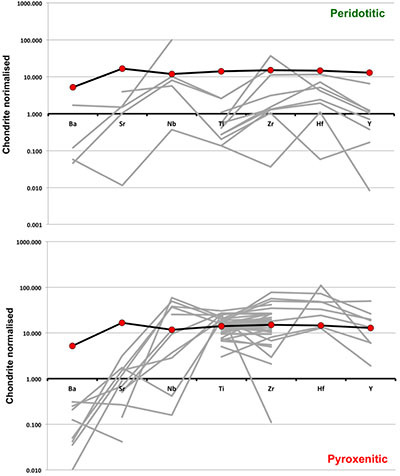 Using geobarometers based on the Si content of majoritic garnet (Collerson et al., 2010; Beyer, 2015), these inclusions were formed at pressures of 7-18 GPa with values above 15 GPa being rare. Estimates of the amounts of carbonate subducted into the mantle range from 2.4 to 4.8 x 1013 g of C per year (Dasgupta and Hirschmann, 2010) and numerous studies have indicated that most carbonate survives this process, carrying a characteristic isotopic signature into the deeper mantle (e.g., Kerrick and Connolly, 2001; Yaxley and Brey, 2004). Given the wide range of compositions and mineralogies found in such “pyroxenites” it is likely that more than one mechanism applies (Downes, 2007). Kiseeva et al. (2013a) showed, however, that the majority of the inclusions exhibit the peridotitic substitution but have high Ca (up to 14.7 wt. % CaO), low Cr (<0.53 wt. % Cr2O3) and low Mg# (~50-80) indicating source compositions intermediate between those of eclogite and peridotite (Figs. 1, 2; Hirschmann and Stolper, 1996). Figures 2 a,b,c show bulk rock compositions of natural pyroxenites (e.g., Hirschmann and Stolper, 1996) together with observed compositions of garnet inclusions in diamond and those of clinopyroxenes calculated to coexist with these garnets. For simplicity we have placed a putative “bulk” composition for the source of each inclusion on the red regression line through the pyroxenite compositional data of Hirschmann and Stolper (1996). The large number of pyroxenites found in ophiolitic complexes, alpine massifs, and as mantle xenoliths (Hirschmann and Stolper, 1996; Fig. 2a) suggest that there are common and widespread mechanisms for the formation of lithologies intermediate between a typical basalt (or eclogite) and peridotite. The inheritance of shallow crustal signatures observed in sublithospheric pyroxenitic inclusion assemblages (e.g., negative Eu anomalies at elevated MREE-HREEN; Tappert et al., 2005) and elevated δ18O signatures (Ickert et al., 2015) are predictable outcomes of our model. Surprisingly, despite their subordinate abundance in mantle fragments, pyroxenitic compositions appear be the dominant sources of majoritic garnet inclusions in diamonds, the principal window into the mineralogy of the deep upper mantle and the transition zone (Kiseeva et al., 2013a). These intermediate compositions are broadly pyroxenitic (Kiseeva et al., 2013a). However, the predominance of sublithospheric garnet inclusions of pyroxenitic affinity (Kiseeva et al., 2013a) strongly suggests that one important and widespread mechanism involves carbon. We also found direct evidence of diamond growing in carbonate in an experiment performed on carbonated eclogite at 13 GPa and 1400 °C (Kiseeva et al 2013b). In such cases, according to Korzhinskii (1959), we would expect development of high variance assemblages, typically monomineralic zones, controlled by diffusion of major elements between the two components. That these rocks have been subjected to high pressure (>4.5 GPa) is evidenced by the presence in the pyroxenites of graphite pseudomorphs after diamond (Pearson et al., 1993). Similarly, Stagno et al. (2013) have shown experimentally that, in normal mantle, carbonate is replaced by diamond and Fe3+-bearing garnet at depths below ~160 km further confirming the validity of our model. Measurements of Fe3+/Fe2+ ratios in garnets from the deeper parts of the continental lithosphere (e.g., Woodland and Koch, 2003) support this hypothesis of increasing stability of diamond relative to carbonate with increasing depth. 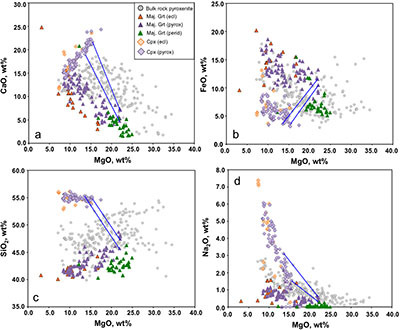 In Figure 2 of the paper we define the compositional space occupied by peridotites, eclogites, pyroxenites and diamond inclusions solely in terms of a plot of bulk MgO versus Al2O3. We show that pyroxenites are intermediate between peridotite and MORB in MgO-Al2O3 space. Supplementary Figure S-1a-d adds data for CaO, FeO, SiO2 and Na2O and shows that many of the majoritic inclusions in diamonds are themselves of broadly pyroxenitic composition even in the absence of clinopyroxene. When we add different amounts of calculated equilibrium clinopyroxene (see tie lines) a large fraction of the pyroxenite field is covered by the 2-phase assemblages. Wilding, M.C. (1990) A study of diamonds with syngenetic inclusions. PhD thesis. University of Edinburgh, p. 281. Moore, R.O., Gurney, J.J., Griffin, W.L., Shimizu, N., 1991. Ultra-high pressure garnet inclusions in Monastery diamonds: trace element abundance patterns and conditions of origin. European Journal of Mineralogy 3, 213-230. Hutchinson, M.T. (1997) Constitution of the deep transition zone and lower mantle shown by diamonds and their inclusions. PhD thesis. University of Edinburgh, pp. vol. 1. 340 pp., vol. 2. 306 pp. Stachel, T., Harris, J.W. (1997) Diamond precipitation and mantle metasomatism - evidence from the trace element chemistry of silicate inclusions in diamonds from Akwatia, Ghana. Contributions to Mineralogy and Petrology 129, 143-154. Stachel, T., Harris, J.W., Brey, G.P. (1998a) Rare and unusual mineral inclusions in diamonds from Mwadui, Tanzania. Contributions to Mineralogy and Petrology 132, 34-47. Stachel, T., Viljoen, K.S., Brey, G., Harris, J.W. (1998b) Metasomatic processes in lherzolitic and harzburgitic domains of diamondiferous lithospheric mantle: REE in garnets from xenoliths and inclusions in diamonds. Earth and Planetary Science Letters 159, 1-12. Wang, W.Y., Sueno, S., Takahashi, E., Yurimoto, H., Gasparik, T. (2000) Enrichment processes at the base of the Archean lithospheric mantle: observations from trace element characteristics of pyropic garnet inclusions in diamonds. Contributions to Mineralogy and Petrology 139, 720-733. Kaminsky, F.V., Zakharchenko, O.D., Davies, R., Griffin, W.L., Khachatryan-Blinova, G.K., Shiryaev, A.A. (2001) Superdeep diamonds from the Juina area, Mato Grosso State, Brazil. Contributions to Mineralogy and Petrology 140, 734-753. Pokhilenko, N.P., Sobolev, N.V., McDonald, J.A., Hall, A.E., Yefimova, E.S., Zedgenizov, D.A., Logvinova, A.M., Reimers, L.F. (2001) Crystalline inclusions in diamonds from kimberlites of the Snap Lake area (Slave Craton, Canada): new evidences for the anomalous lithospheric structure. Doklady Earth Sciences 380, 806-811. Davies, R.M., Griffin, W.L., O'Reilly, S.Y., Andrew, A.S. (2003) Unusual mineral inclusions and carbon isotopes of alluvial diamonds from Bingara, eastern Australia. Lithos 69, 51-66. Pokhilenko, N.P., Sobolev, N.V., Reutsky, V.N., Hall, A.E., Taylor, L.A. (2004) Crystalline inclusions and C isotope ratios in diamonds from the Snap Lake/King Lake kimberlite dyke system: evidence of ultradeep and enriched lithospheric mantle. Lithos 77, 57-67. Tappert, R., Stachel, T., Harris, J.W., Muehlenbachs, K., Ludwig, T., Brey, G.P. (2005) Diamonds from Jagersfontein (South Africa): messengers from the sublithospheric mantle. Contributions to Mineralogy and Petrology 150, 505-522. Bulanova, G., Walter, M., Smith, C., Kohn, S., Armstrong, L., Blundy, J., Gobbo, L. (2010) Mineral inclusions in sublithospheric diamonds from Collier 4 kimberlite pipe, Juina, Brazil: subducted protoliths, carbonated melts and primary kimberlite magmatism. Contributions to Mineralogy and Petrology 160, 489-510. ). As can be seen, despite the evident scatter all the peridotitic majorites are significantly more depleted in LILE, HFSE and REE than pyroxenitic majorites. According to our model of basalt-peridotite interaction, the pyroxenites inherit large fractions of these trace elements from their basaltic precursors. McDonough, W.F., Sun, S.S. (1995) The Composition of the Earth. Chemical Geology 120, 223-253. Jenner, F.E., O'Neill, H.S. (2012) Analysis of 60 elements in 616 ocean floor basaltic glasses. Geochemistry Geophysics Geosystems 13. 45, 324-336. Irifune, T. (1987) An experimental investigation of the pyroxene garnet transformation in a pyrolite composition and its bearing on the constitution of the mantle. Physics of The Earth and Planetary Interiors 45, 324-336. Yasuda, A., Fujii, T., Kurita, K. (1994) Melting phase relations of an anhydrous mid-ocean ridge basalt from 3 to 20 GPa: implications for the behavior of subducted oceanic crust in the mantle. Journal of Geophysical Research-Solid Earth 99, 9401-9414. Okamoto, K., Maruyama, S. (1998) Multi-anvil re-equilibration experiments of a Dabie Shan ultrahigh-pressure eclogite within the diamond-stability fields. The Island Arc 7, 52-69. Wang, W.Y., Takahashi, E. (1999) Subsolidus and melting experiments of a K-rich basaltic composition to 27 GPa: implication for the behavior of potassium in the mantle. American Mineralogist 84, 357-361. Litasov, K.D., Ohtani, E. (2005) Phase relations in hydrous MORB at 18-28 GPa: implications for heterogeneity of the lower mantle. Physics of the Earth and Planetary Interiors 150, 239-263. Litasov, K.D., Ohtani, E. (2009) Solidus and phase relations of carbonated peridotite in the system CaO-Al2O3-MgO-SiO2-Na2O-CO2 to the lower mantle depths. Physics of the Earth and Planetary Interiors 177, 46-58. Bobrov, A.V., Litvin, Y.A., Bindi, L., Dymshits, A.M. (2008) Phase relations and formation of sodium-rich majoritic garnet in the system Mg3Al2Si3O12-Na2MgSi5O12 at 7.0 and 8.5 GPa. Contributions to Mineralogy and Petrology 156, 243-257. Litasov, K., Ohtani, E. (2010) The solidus of carbonated eclogite in the system CaO-Al2O3-MgO-SiO2-Na2O-CO2 to 32 GPa and carbonatite liquid in the deep mantle. Earth and Planetary Science Letters 295, 115-126. Kiseeva, E.S., Litasov, K.D., Yaxley, G.M., Ohtani, E., Kamenetsky, V.S. (2013) Melting and phase relations of carbonated eclogite at 9–21 GPa and the petrogenesis of alkali-rich melts in the deep mantle. Journal of Petrology 54, 1555-1583. Equation S-2 enables us to use the garnet composition to calculate Mg/(Mg+Fe)cpx. We then have all relationships necessary to calculate the bulk clinopyroxene composition except for minor elements such as Ti, Cr and Mn. We used our model to reconstruct the compositions of clinopyroxenes in equilibrium with majoritic garnet inclusions prior to estimating a pyroxenitic bulk rock composition for the sources of the inclusions. Moore, R.O., Gurney, J.J. (1989) Mineral inclusions in diamond from Monastery kimberlite, South Africa, in: Ross et al..(Editors), Kimberlites and related rocks, Proceedings of the IVth International Kimberlite Conference. Blackwell, Carlton, Perth, pp. 1029-1041. Stachel, T., Brey, G.P., Harris, J.W. (2000) Kankan diamonds (Guinea) I: from the lithosphere down to the transition zone. Contributions to Mineralogy and Petrology 140, 1-15. Davies, R.A., Griffin, W.L., O'Reilly, S.Y., McCandless, T.E. (2004) Inclusions in diamonds from the K14 and K10 kimberlites, Buffalo Hills, Alberta, Canada: diamond growth in a plume? Lithos 77, 99-111. ). In Figure S-4 we compare calculated and reported (measured) clinopyroxene compositions for these occurrences of clinopyroxene-garnet pairs. As can be seen, agreement between calculated and observed compositions is generally good, despite the distinct possibility that in some cases, the garnet and pyroxene were never in equilibrium with one another. Beyer, C. (2015) Geobarometry, phase relations and elasticity of eclogite under conditions of Earth’s upper mantle. PhD thesis. University of Bayreuth, Interdisciplinary Institutions. 217pp. and by our simplified geobarometer, based on Si-content of the majorite: P = (Si-3 + 0.11) / 0.026, where Si is the number of Si cations in majoritic garnet per 12 oxygen formula unit. All three geobarometers indicate that the majority of majoritic inclusions in diamond formed at pressures below 13-15 GPa, which means that they are likely in equilibrium with clinopyroxene. ). Model carbonated (~5 % CaCO3) peridotite and eclogite in the CMAS system were loaded into a Pt capsule in roughly 50/50 proportions (see Table S-1). McDade, P., Wood, B.J., Van Westrenen, W., Brooker, R., Gudmundsson, G., Soulard, H., Najorka, J., Blundy, J. (2002) Pressure corrections for a selection of piston-cylinder cell assemblies. Mineralogical Magazine 66, 1021-1028. Temperature (1350 °C) was controlled and measured using a C-type (W95Re5–W74Re26) thermocouple separated from the capsule by a 0.8 mm alumina disc (Table S-1). Experiment duration was between 1.5 and 8 hours after which the run was quenched by cutting the power to the graphite heater while maintaining run pressure, which was subsequently slowly released. The recovered experimental products were mounted in acrylic resin, sectioned and hand-polished using water based lubricants and diamond pastes. We report in Table S-2 phase compositions from the longest experiment (Sa2-1) in which the reaction between eclogite and peridotite was best developed (Fig. 4 of main text). Grassi, D., Schmidt, M.W. (2011) The melting of carbonated pelites from 70 to 700 km depth. Journal of Petrology 52, 765-789. A Re capsule was used and the pyroxenite sample (Table S-2) was held at 15 GPa and 2150 °C for 2 hours. The experiment was quenched by turning off the power supply, resulting in temperature dropping below 500 °C in less than 1 second. The recovered capsule was mounted into a low-viscosity epoxy resin ground and polished with diamond powder (1 and 3 microns diameter). Finally, polished mounts were coated with a carbon film for electron microprobe analysis. All experimental run products were analysed using a JEOL JXA8600 electron microprobe at the Department of Archaeology at the University of Oxford. WDS analyses were conducted using a 15 kV accelerating voltage and 20 nA beam current with a focused beam of 1 micron spot in order to avoid overlapping phases. At least 50 repeat analyses were collected for each of the phases in the products. Counting times were as follows: 30 seconds peak and 15 seconds background for major elements (e.g., Si, Al, Ca, Mg, Fe); 60 seconds peak and 30 seconds background for minor elements Ti, Mn, Na, K, Cr. A range of synthetic and natural standards was used for calibration. Standards for silicate glass and olivine analysis were natural wollastonite (Ca, Si), synthetic periclase (Mg), rutile (Ti), fowlerite (Mn), natural albite (Na, Al) and hematite (Fe), orthoclase (K), chromite (Cr). CO2 in melt estimated by difference. Cpx – clinopyroxene, Opx – orthopyroxene, Grt – garnet, Fo - forsterite, Co - coesite, Cor - corundum. We performed experiments to simulate reaction across a sharp compositional boundary between peridotite and basalt (coesite-eclogite at 3 GPa), analogous to the situation in subducted lithosphere having veins and lenses of basaltic composition dispersed in peridotite (Allègre and Turcotte, 1986). Pressure was estimated using three geobarometers: by Collerson et al. (2010), by Beyer (2015) and by our simplified geobarometer, based on Si-content of the majorite: P = (Si-3 + 0.11) / 0.026, where Si is the number of Si cations in majoritic garnet per 12 oxygen formula unit. We developed a model of Na partitioning between garnet and clinopyroxene at P of 7.5-21.5 GPa and T of 900-1700 °C using experimentally recrystallised garnet-clinopyroxene pairs from a number of experimental studies (Irifune, 1987; Yasuda et al., 1994; Okamoto and Maruyama, 1998; Wang and Takahashi, 1999; Litasov and Ohtani, 2005, 2009; Bobrov et al., 2008; Litasov and Ohtani, 2010; Kiseeva et al., 2013). In Figures S-2 and S-3 we show the few available data in the literature on the REE, LILE and HFSE contents of majoritic diamond inclusions (Wilding, 1990; Moore et al., 1991; Hutchinson, 1997; Stachel and Harris, 1997; Stachel et al., 1998a,b; Wang et al., 2000; Kaminsky et al., 2001; Pokhilenko et al., 2001; Davies et al., 2003; Pokhilenko et al., 2004; Tappert et al., 2005; Bulanova et al., 2010). Figure S-4 [...] Clinopyroxene compositions are taken from the following studies: Moore and Gurney, 1989; Wilding, 1990; Hutchinson, 1997; Stachel et al., 2000; Davies et al., 2004; Pokhilenko et al., 2004; Bulanova et al., 2010. 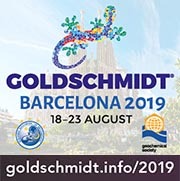 A number of studies have reported clinopyroxene(s) included in the same diamond as majoritic garnet (Moore and Gurney, 1989; Wilding, 1990; Hutchinson, 1997; Stachel et al., 2000; Davies et al., 2004; Pokhilenko et al., 2004; Bulanova et al., 2010). Details of assembly design and pressure calibration of the Zurich multianvil is given in Grassi and Schmidt (2011). Figure S-2[...] Red circles show abundances for primitive (>8.7 wt. % MgO) MORB glasses (Jenner and O'Neill, 2012). Figure S-3[...] Red circles show abundances for primitive (>8.7 wt. % MgO) MORB glasses (Jenner and O'Neill, 2012). The experimental pressure (3 GPa) used the calibration of McDade et al. (2002). Figure S-2[...] Majoritic garnet LILE and HFSE abundances normalised to CI-chondrite. (McDonough and Sun, 1995). Figure S-3[...] Majoritic garnet REE abundances normalised to CI-chondrite (McDonough and Sun, 1995).